performing all sorts of tasks and duties year after year!" 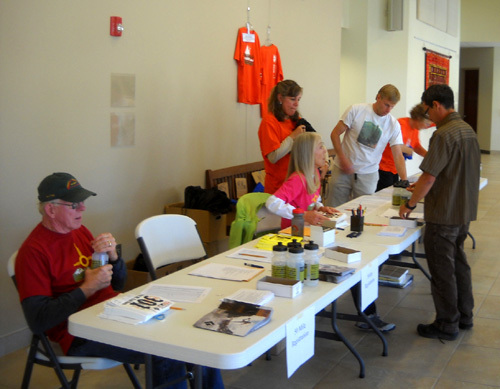 The same can be said for any foot race, but ultra-distance events with 700 entrants really need a lot of volunteer assistance before, during, and after the Big Day -- and the Jemez race staff really knows how to take care of its volunteers. We're both participating as volunteers for the third year in a row and Jim is running the 50K tomorrow. 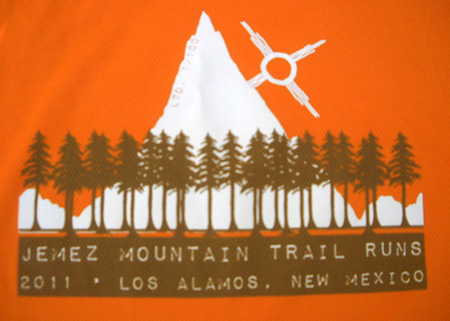 This rugged mountain trail event has grown significantly since Aaron Goldman launched the first version six years ago with the enthusiastic support of the local ultra running contingent and other folks in the community. Even with their generous limit on the number of runners allowed, the three races reached capacity by March 1 of this year. 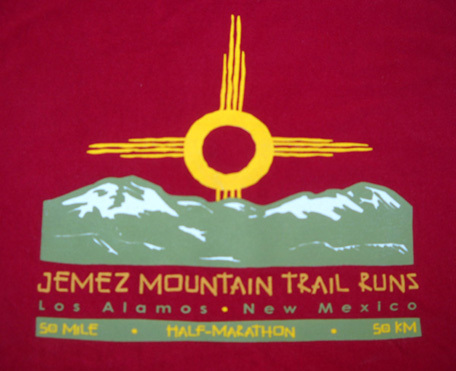 The original 50K and 50-mile distances proved to be so popular that a half-marathon was added to the line-up so more people could participate. Over the years the race staff has developed a good relationship with the National Forest Service and local jurisdictions, allowing a sizeable field of runners and walkers to use the trails on race day. Current co-RDs Bill Geist and Kris Kern expect at least 600 of the entrants to show up to run tomorrow. That's a bunch! The only thing missing from this event is the presence of the original founder. Aaron passed away a couple of years ago and his absence is palpable to those of us who knew him. 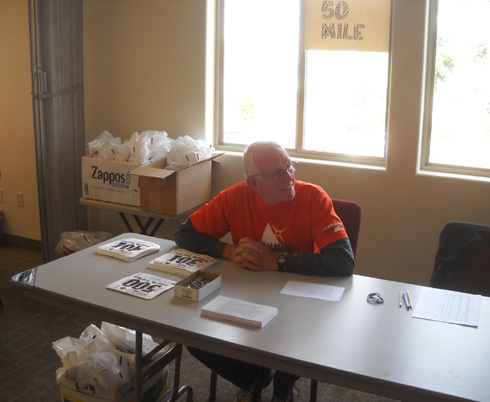 Based on the increased number of entrants and runner/volunteer feedback after last year's race, Bill and Kris made several changes to the event this year to increase efficiency. One of those changes was to add two more days to the packet-pickup options. Although advanced planning for the race began long before this week, Jim's and my volunteer involvement started yesterday. I made it lighter so it's easier to read the numbers. 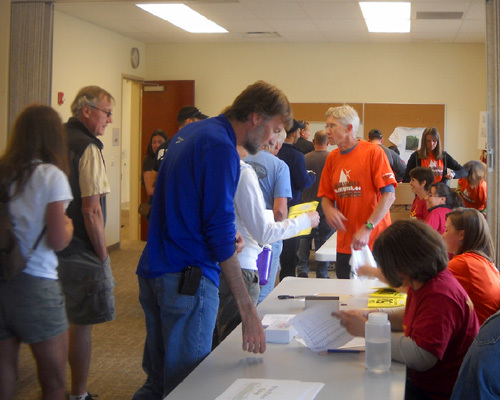 Runners had the opportunity this year to pick up their race packets during certain hours on Wednesday, Thursday, Friday, or Saturday. Many local runners chose to pick theirs up on Wednesday afternoon or Thursday evening, avoiding the crowds on Friday and Saturday. and Nena. Rebecca is mostly hidden behind Jim, talking to Bill. That also gave us an opportunity to learn more about our jobs the next day when we'd be volunteering. Rebecca Clark, who we know from previous Jemez races and Hardrock, is in charge of the registration/packet process this year (Rebecca is married to ultra runner Blake Wood). Rebecca's very organized and has race registration procedures down to a science this year. It has been a pleasure to work with her. On Thursday Jim and I drove over to the Crossroads Bible Church on East Road to work packet pickup from 4:30 to 6:30 PM. We got there early enough to meet the other volunteers and determine what our jobs would be. Front to back, behind the tables: Jim, Nena, Suzette, Bill, Rebecca; the empty seat is mine. Jim handled the 50-mile entrants, I did the 50Kers, and two other women, Nena and Suzette, checked in the half-marathoners. The shortest race had the most entrants. Rebecca and Bill supervised and handled any problems. 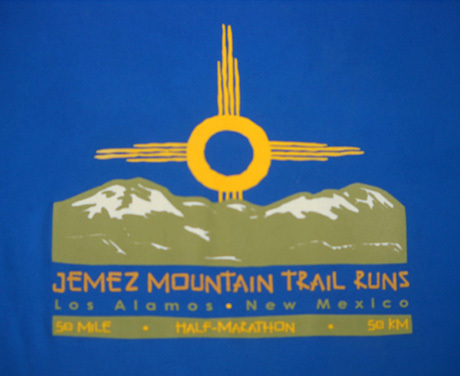 In addition to the handsome brick red cotton volunteer t-shirts we got yesterday (and Jim's bright blue technical race entrant's shirt) . . . 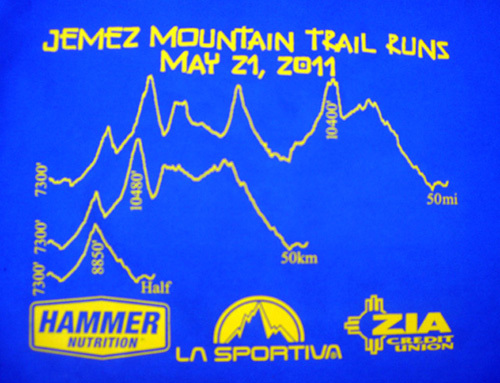 Bright "technical" shirt given to some of the volunteers and for sale to runners. 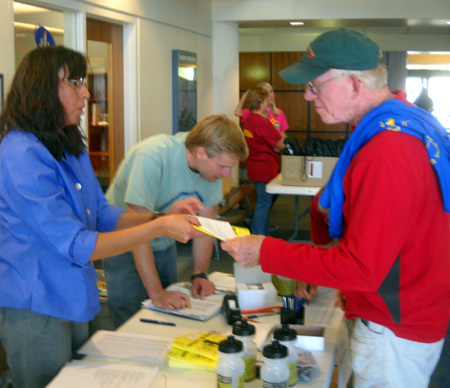 Only about 80 people picked up their packets on Thursday and fewer than that on Wednesday. That left over 500 for Friday evening and Saturday morning before the race. Hopefully in subsequent years more folks will get their packets early, if the option remains. This morning Cody and I hiked the Bayo Canyon trail loop. Jim ran errands. Then we had some time to kill before our next volunteer assignment from 4-6 PM. Jim called Bill Geist to see if he needed any help during the afternoon. Yes -- how about helping me get all the trays of enchiladas for the post-race feed and taking them to the Posse Shack? That didn't take much time and it helped Bill with one of his many tasks today. It also gave us the opportunity to find out about a good restaurant for Mexican food -- the Hot Rocks Java Caf�, located on LANL property in Los Alamos. Those enchiladas are fantastic! 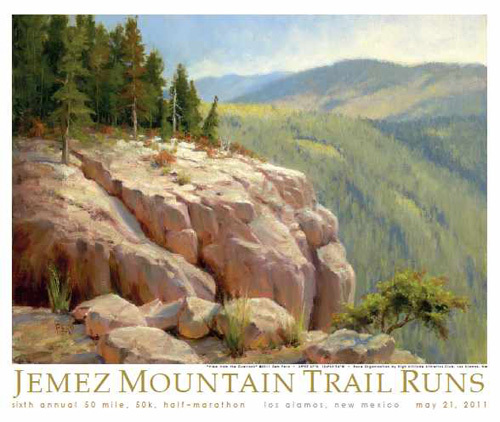 The Jemez staff really takes care of the runners and volunteers. 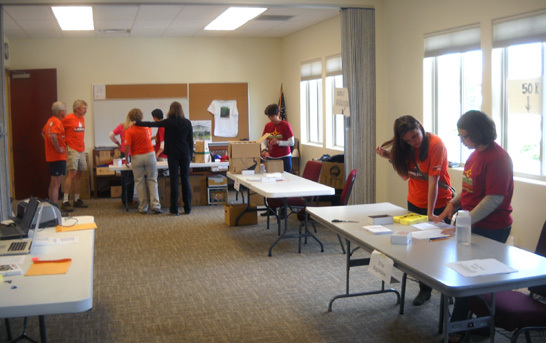 We returned to the church at 4 PM to help set up the registration materials in a different room, shown above. To reduce congestion, runners were directed to come in one end of the room to receive their packets and go out the other end. Because of the large number of people who'd be picking up their packets while they were there for the pre-race dinner, the runners' manual on the race website suggested folks whose last names begin with A-J come in between 4:30-6 PM and those in the K-Z range from 6-7:30 PM. No one was turned down if they came at the "wrong" time, however. Jim and I worked the first shift from about 4-6 PM, then went downstairs for dinner. Quite a few runners came to our 50-miler table, above (again, the empty seat is mine). We chose to handle those packets because we know more of the runners in that race than in the two shorter ones. It was fun to see friends as they came in, although we were so busy that we didn't have time to talk with them much. 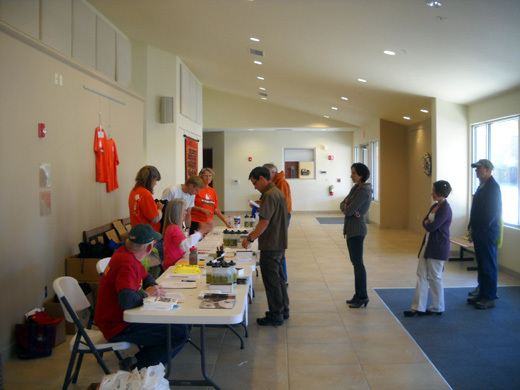 Ultra runner Steve Pero, standing in the bright orange shirt, also helped with packet pickup. The pre-race dinner, which was free to runners and guests (donations requested for guests), began about 5 PM. Last year we almost missed dinner; by the time we were done with packet pickup, some of the food was gone. By working the first shift this time, we were able to get downstairs while all the food was still available and fresh, have time for a leisurely meal with friends, and get home at a reasonable hour so we can get to bed early. After all, Jim has to be at the start line (about a hundred yards from our camper) at 6:30 AM for the 50K race start. I'm helping with half-marathon registration after the 50K begins.